A group of about 60 scientists from Luxembourg-based Element Six, a company owned by giant De Beers, is working on exotic materials using synthetic diamonds. But, unlike most man-made gems we currently know, De Beers' rocks are made not by the known method of subjecting carbon to huge forces in industrial presses, but by “growing” atoms one by one inside special chemical reactors heated to about 1,000 degrees centigrade. Financial Times is reporting (subs. 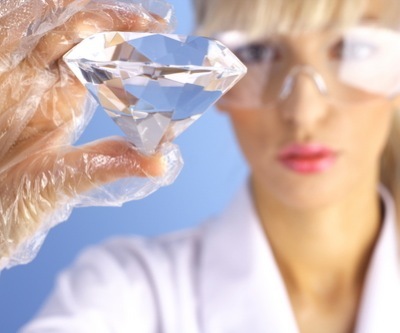 required) that these types of diamonds could revolutionize key processes in global manufacturing. Man-made stones are nothing new. General Electric created lab diamonds in 1950s, presumably for commercial use. But it wasn't until 1970 that the firm was able to produce gem-quality diamond crystals. After years of research, The De Beers Diamond Research Laboratory, established only a year after the company’s launch, grew stones of 25 carats, but found later that the lengthy procedure made their production rather unsustainable. Currently synthetic diamonds are used mainly in industrial and high technology applications, but Clive Hill, founder and president of Washington Diamonds, told MINING.com these gems are finding increased acceptance in the consumer world. As the public becomes increasingly aware of the corrupt and often deadly nature of the diamond trade, said the executive, consumers are choosing synthetic diamonds as a “conflict-free” and significantly cheaper alternative. But DeBeers’ ongoing development goes beyond jewellery, says FT.com. So far, its potential applications range from novel semiconductors and sensors to special optical “windows,” which allow high-power lasers to perform more useful tasks in industries such as car manufacturing.